We tiptoed through the tulips again today, and it was as gorgeous the second time as it had been the first. While it wasn't as sunny as it was last year, at least it was not rainy, as had been feared. And by the middle of the day, the sun was peeking out behind the clouds anyway. One big difference was that the ground was very muddy, so in some cases it literally was tiptoeing through the tulips, and through everything else as well. But it was well worth the trip. 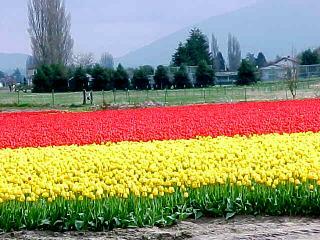 We first stopped at Tulip Town, which we had visited last year. Last year I didn't know what to expect. This year I was prepared for the patchwork quilt of color and it still took my breath away. Masses of color as far as the eye can see...pinks, oranges, purples, yellows, reds. 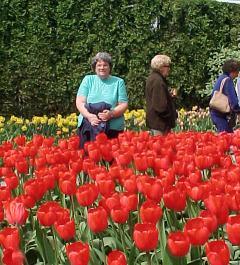 And everywhere were parents taking pictures of toddlers crouched down behind the tulips. At Tulip Town there was even a "tulip trolly," hauling folks out to the fields by mule-drawn cart. 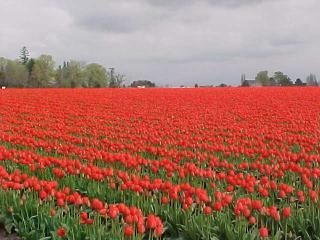 When we had sampled everything here, it was time to continue on the tulip trail. Eventually, we pulled ourselves away from this place and did find Roozengaard, and as was promised, this was definitely the king of the tulip fields. This place has every possible kind of tulip imaginable--and some that aren't imaginable, but which exist anyway. We spent a lot of time here, until we ran out of steam and decided we were "tulip-ed" out for the day. Then turned the wheels of the shiny red Cadillac homeward. And now we're just sitting back looking at the hundreds of photos we took, and planning what we're going to do tomorrow (probably go to the zoo).